Mayors and governors who represent high threat, high-density urban areas need strategic, decision-making advantages and, as such, should be significant users of intelligence products developed by state and local fusion centers. These chief executives desire to understand the operating environment for their jurisdictions where daily risks and threats emerge from the complexities of an integrated world. 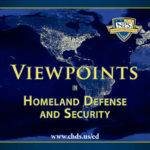 In this Viewpoints interview, recent CHDS graduate Yi-Ru Chen discusses her thesis which examines the numerous advantages in engaging these top-level officials in this discourse.